My extended family has been playing Ticket to Ride for years. It’s one of our go-to games after Christmas or Thanksgiving dinner, and we’ve all gotten comfortable with the mechanics, the strategy, and the map. We’ve mixed it up a bit by adding in the 1910 expansion, but for the most part the game’s been the same for years. Ticket to Ride: Europe takes the basic premise of the game, and mixes it up by moving the game to the Old Country and introducing a bunch of new mechanics. It’s a more complicated, more tactical version of Ticket to Ride that nicely builds on what came before. As with the base game, Ticket to Ride: Europe is all about completing destinations. The map includes major and minor European cities connected by routes that take a varying number of tickets to complete. At the beginning of the game you draw up to four “destination” cards, which award you a set number of points for completing. The further apart two destinations are, the more points the card is worth. You also start with a hand of four different colored tickets. You collect tickets of certain colors — e.g. all red, all blue, all yellow — to complete routes, building toward your destinations. Multi-colored locomotives are wild cards, and can be used to round out the tickets needed to complete a route. The game adds three mechanics to the base game: tunnels, ferries, and train stations. Tunnels: Normally when you complete a route, you need to lay down 1 or more tickets of the same color. Tunnels are the same but before you can officially complete the route, you need to draw three tickets off the top of the ticket pile. If any of them match the color of the route you’re completing (e.g. you draw a blue ticket when trying to complete a blue route), then you have to pay an extra ticket of that color for every card drawn. This can mean that even a simple two-ticket tunnel can suddenly cost five tickets. If you’re not prepared for it, that can stymie you for a turn. Ferries: In addition to the standard land and tunnel routes, the game has water routes traversable by ferry. To complete them you have to play the standard suite of colored cars plus one or more wild-card locomotives (it varies based on the route). Train Stations: Sometimes you need one more route to complete a destination card, but someone else beat you to it. Train stations allow you to use that route as one of your own. The game gives you three train stations; the first costs one card of any color, the second costs two cards of the same color, the third costs three of the same color. If you don’t use them, you get four points per unused station at the end of the game. The game also introduces “long destination” cards. These high value, difficult-to-complete cards are the European equivalent of the New York-to-San-Francisco run. Unlike Ticket to Ride, which has many such long routes, Europe only has six of them, and each player receives one as part of their opening hand of destination cards. The full Ticket to Ride: Europe Map, with half-completed destinations represented by different colored plastic pieces. The “tickets” are arrayed along the bottom of the map. Credit: Ken Newquist. The game’s new mechanics are driven by the design of the European map, which feels far less expansive than the original United States one. The new map includes western Europe as well as eastern Europe and Asia Minor as far as Istanbul, Petrograd, and Sochi. Going into the game I thought I was pretty good a European cities, but it turns out I’m actually just good at western European cities. I’ve heard of the big eastern cities (remember: Istanbul not Constantinople) but I was utterly lost when it came to the more obscure ones. That alone ups the challenge rating of the game by forcing you to look closely at the map, and come up with strategies for remembering where the heck you were going. Particularly in western Europe, the map is dense and packed with routes. Getting from Madrid to London or Barcelona to Berlin can be a challenge when playing with a 4 or 5 players, and it is here where having options for ferries and train stations really pay off. The map opens up in the east, but to get there you have to pass through the mountainous regions of German, Switzerland, Austria, and Italy. The mountains are filled with tunnels and the mechanic prevents players from quickly snapping up routes. They also introduce an element of chance to the game that simply isn’t there in Ticket to Ride: Do you spend a few turns picking up some insurance tickets you might never need? Or do you make the gamble and try to complete the tunnel using the minimum number of tickets? We played the game with five players, and the map became positively packed with routes by the end of the game. Tunnels were heavily used by all, but fewer people used the train stations. I think that’d be different in later games; we’re still used to conventional Ticket to Ride, and train stations hadn’t really factored into our tactical thinking just yet. The game components are nicely put together, and incorporates the larger-sized ticket and destination cards we saw in the 1910 expansion. That made life easier for everyone as the new cards are easier to see and hold than the old-style ones for the original Ticket to Ride. 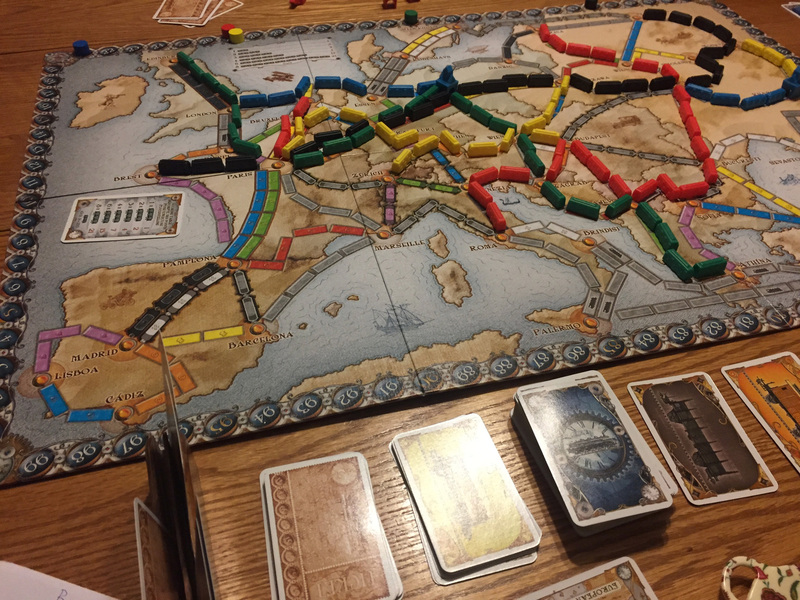 Ticket to Ride: Europe builds on the success of Ticket to Ride. It offers a more challenging and thoughtful game by introducing a densely-packed map and the game mechanics to support it. It is well worth picking up if you love the original game and are looking for a new challenge.